It works in such unfussy, simple fashion that it gets a thumbs-up here. While remaining a choice for serious drummers only (and those who spend a lot of time recording, perhaps), a good number will be won over by its flexible charms. The vents really do make a difference. The price isn’t for the faint of wallet. A choice for serious drummers only. The Acoustic EQ lives up to its promise. The Acoustic EQ is a fine-looking beast. Adjustable vents allow for instant tone tweaking. They might be the finest instruments known to man, but acoustic drums are simple things. Beyond messing around with hi-tech shell materials and funky finishes, there isn't massive scope for innovation. 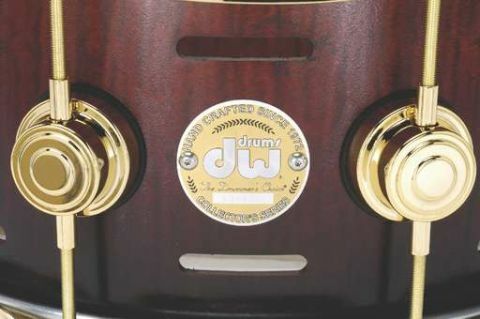 DW's new Acoustic EQ snare, however, is a rare case of forward-thinking (Brazilian custom brand Odery have something similar, but the Acoustic EQ is a refinement of the concept). Building a series of adjustable vents into a standard Collectors Series shell allows for instant tone tweaking - could this be the most user-friendly snare ever? Even ignoring the clever venting system, the Acoustic EQ snare is a fine-looking beast featuring the Collector's Series all-maple shell (some 10 plies thick) finished in Satin Oil with gold hardware. If you're into vintage-with-a-bit-of-bling it'll probably crank your handle. Leaving aside the venting system, the spec is pretty straightforward, with triple-flanged hoops, characteristic DW 'turret' lugs and a slick Delta ball bearing snare throw-off. But, of course, it's the vents you're all interested in, so on to them. Operated by two reasonably-sized metal handles, there are two rows of rectangular vents at the top and bottom of the shell. A couple of inches long, these can be fully or partially opened, with each row operating independently of the other. The premise is that with both sets of vents wide open there's more snare wire crackle and openness, while closing them delivers a more focused, fatter low-end. In practice, the Acoustic EQ snare lives up to its promise. The basic 'all-open' sound is crisp, muscular and just what we've come to expect from Collector's snares. Bringing the vents into play makes a discernible difference to the tonality. Progressively closing them allows you to dial in just the amount of mid-range focus and control you're after, which makes this snare a great prospect for recording. Rather than faff with bits of gaffer tape or damping gel, a good deal of EQing can be taken care of 'in-snare' as it were, making the Acoustic EQ an exceptionally flexible, responsive partner. The vents don't allow the transformation of tone to mimic everything from soprano snare to 8" deep metal mutha, but do add a very welcome level of control. There's bound to be some cynicism toward the Acoustic EQ snare from those who have never heard one in action. After all, just how much difference can a few vents make to a drum's sound? The answer is enough to have a significant effect on the way the drum delivers.